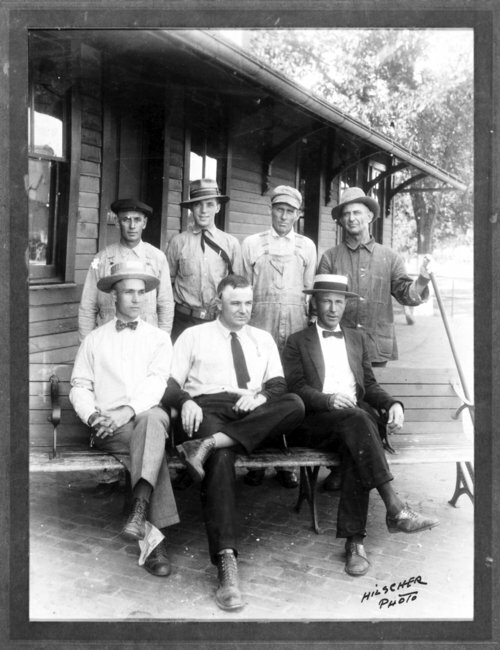 Members of the Chicago, Rock Island, and Pacific Railway Company's yard force in McFarland, Kansas. They are identified as (top row, left to right) St. Kent, night bell clerk; Harold Nunn, chief yard clerk; Sorgum Johnson, night yardmaster; George Lane, station porter; (bottom row, left to right) John L. Williams, agent; Archie Edgar, day operator; Chas. L. Toler, general yardmaster.